Normally I don't write posts about TV shows I watch but last weekend's episode featured quite a powerful scene in which the Doctor had to diffuse a potentially devastating war right as it was beginning. Shapeshifting alien refugees had settled on Earth peacefully, in human disguise, until a small faction of them demanded the right not to have to hide, and began killing people to make their point. The conflict winds up in an MI-5-type facility where the humans and the aliens face off, each with one hand over a button that could wipe out the other side. The alien's leader has taken the form of the Doctor's companion, Clara. The important part is transcribed below. It's quite powerful, and should be a good resource for anyone teaching History or CSPE - or indeed, anyone teaching at all. Everyone, fingers on buzzers! Are you feeling lucky? Are you ready to play the game? Who's going to be quickest? Who's going to be luckiest? No, it's not a game sweetheart, and I mean that most sincerely. Yes, I'd quite like to know that too. You set this up, why? Because it's not a game, Kate! This is a scale-model of war! Every war ever fought, right there in front of you! Because it's always the same. When you fire that first shot, no matter how right you feel, YOU HAVE NO IDEA WHO'S GOING TO DIE! You don't know whose children are going to scream and burn! How many hearts will be broken! How many lives shattered! How much blood will spill, until everybody does what they were always going to have to do from the very beginning: SIT DOWN AND TALK! 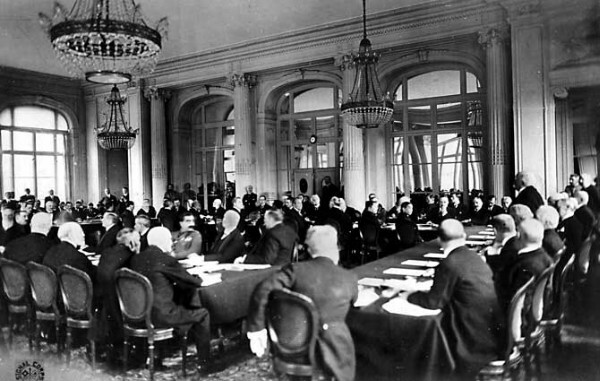 The Paris Peace Talks which followed World War I, 1919. 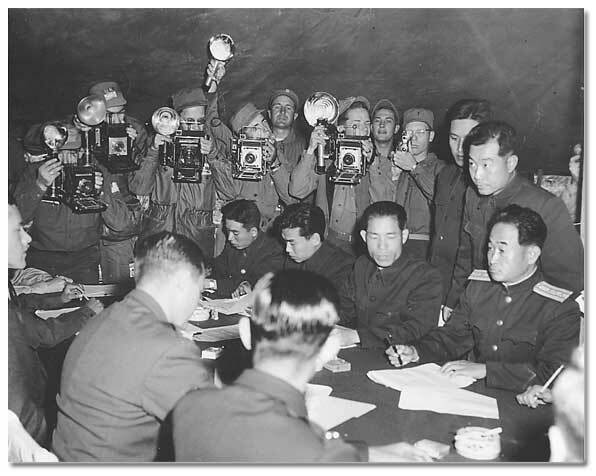 Armistice talks following the Korean War, 1953. 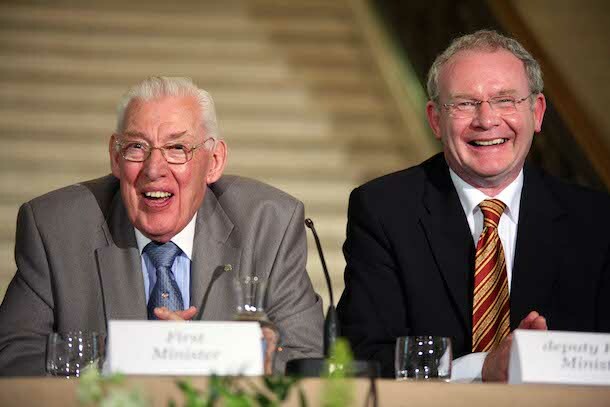 Ian Paisley, unionist, and Martin McGuinness, nationalist, sitting together as joint First Ministers of Northern Ireland after decades of conflict, 2007. 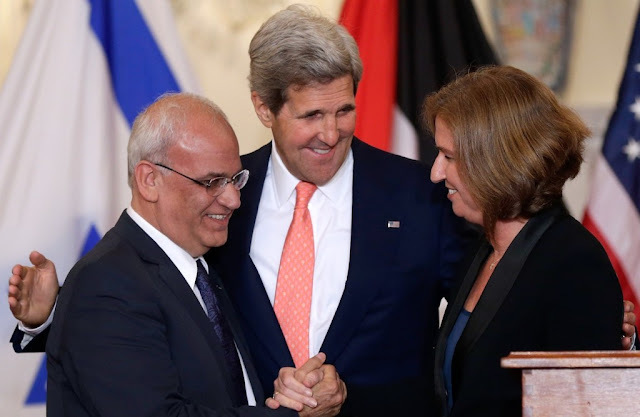 US Secretary of State John Kerry with Palestinian negotiator Saeb Erekat and Israeli Justice Minister Tzipi Livni at meeting for a peace negotiation, 2015. Listen to me, listen. I just want you to think. Do you know what thinking is, it's just a fancy word for changing your mind. Then you will die stupid. Alternatively, you could step away from that box, you could walk right out of that door, and you could stand your revolution down. No. I'm not stopping this, Doctor. I started it, I will not stop it. You think they'll let me go after what I've done? You're all the same, you screaming kids, do you know that? "Look at me, I'm unforgiveable", well here's the unforeseeale - I forgive you! After all you've done. I forgive you. You don't understand. You will never understand. I don't understand? Are you kidding? Me? Of course I understand. I mean, do you call this a war, this funny little thing? This is not a war! I fought in a bigger war than you will ever know! I did worse things than you could ever imagine and WHEN I CLOSE MY EYES... I hear more screams than anyone could ever be able to count! And do you know what you do with all that pain? Shall I tell you where you put it? You hold it tight, until it burns your hand. And you say this: No-one else will ever have to live like this. No-one else will ever have to feel this pain. Not on my watch! The episode in question was the second part of a two-parter which also dealt with issues surrounding identity, extremism, and the question of what comes after an uprising or revolution - so if you're interested and ever get the chance - however you feel about Doctor Who and science fiction - I recommend checking out "The Zygon Invasion" and "The Zygon Inversion". "...until everybody does what they were always going to have to do from the very beginning: SIT DOWN AND TALK!" That was the "Wow." moment for me. A distillation of the pointlessness of armed conflict. It always leads to a table. So why not just skip the messy bit? Because pride and pain and anger and ego.